Why write a Christmas poem? decked no tree these last few years. and keeps me out of malls. felt "in." And I care. In a grinchy kind of way. that's God who gives us words. Time together the last few days with people I love. Being surrounded by people who understand what I'm doing, that tasting everything they've cooked isn't the only way -- or even a very effective way -- of proving my love to them. A very special conversation I had on Thanksgiving Day. The eight tools of Overeaters Anonymous are a plan of eating, sponsorship, meetings, telephone, writing, literature, anonymity, and service. With many others these days, I rely on the computer for a great many of my connections with other OA's outside the weekly meetings I attend. It's easy to figure all the literature was written years ago, before the computer age, and to assume the computer via email, online meetings, and Internet groups count as a tool as well. Certainly, they're helpful. But computers don't substitute for the tools -- or for any of them. I, and others I sponsor, seem to shy away from that 500 pound monster, the telephone. Personally, I don't rely on the phone as much as many other people, not just for OA but in life situations in general. Today I was looking for information I needed. It had been suggested I get the information by phoning a particular organization. I didn't want to. That recommendation was made last Thursday. I finally called it today. I just don't like the phone particularly. I also called my sponsor. And I'm going to continue to do so. From this point on, I'll use all the tools, including the 500 pound phone. It has to do with will power. You must have will power to overcome obstacles. For example, you can choose to quit smoking rather than continuing to smoke...you can experience an enormous amount of pain and not succomb to the pain......you can loose weight if you decide that is what you want to do. If you have the will power, you can succeed at anything you "put your mind to". This is the essence of what "mind over matter" means. Look at those words. Craving. Phenomenon. Paramount. Beyond their mental control. How hopeless! Phenomenon means can't be understood. Craving is feeling a powerful desire FOR something. Not just an emptiness, not just discontent, restlessness, but the savage need to get the substance, for me, the food, the sugar, the pastry, the ice cream. Paramount. NOTHING can be of more importance. Mind over matter? I think not. I can't think of anything else of my own, by my will power. I'm helpless, hopeless, a failure. My mind can't overcome the matter. No matter what. I'm powerless over food. My life has become unmanageable. But there is a Higher Power who is able to restore me to sanity, to relieve me of the insane cravings, the pain, the phenomenal NEED. And when I let him, he does. Again and again, continually, forever. And besides that, he throws in more than a TV salesman in an informercial could promise or even intimate. And his promises are real and happen. Thank God! Me: Okay, so stand aside and allow them to be fixed. This is the one time it's okay to be helpless. When you're yielding to somebody who really CAN control your life better than you.It's none of your business what anybody, including family, thinks of you. It's none of your business what you weigh. It's none of your business how fast you run. It's out of your hands. You're there to take orders, to do the next right thing. She: how do i know what the order is? me: the order of the next right thing? (In responding to a question about what her character defects might be, I answered from seeing in her what I see in me:) me: It's self-loathing. It's excusing mistakes by thinking they're your nature. Hiding your head in the sand. fill in any blank after the can't. the person you get most irritated by has the character defects you hold onto hardest. Understanding is part of the cure. I'm getting to see more and more what in xxxx is like me. And it's scary, but when you can see it, you can see the way out. She: ok. i am very similar to my mother. Me: And it's natural. But you're also a very creative person who has the ability to see it and grow out of it, not to do what she did which you can see very well doesn't work. Forgive your mother. And forgive yourself. My sponsor told me before I work with somebody to say the 3rd step prayer. That night it was working. It was what she needed to hear, I think. But I absolutely KNOW it was what I needed to hear, to affirm, to accept as the truth for me. Ah yes, eating crow. I do so much less of that these days. I carry my speaking device in my pocket. By the time I dig it out what I was going to say is always edited and goes from what I would have said to what I should say. I mention this at meetings when discussing the 10th step especially. Very few apologies needed with that built-in ten to fifteen seconds. Another blessing in disguise from not being able to talk. My glass has been full today without having to look at it halfway full and deciding to see it that way. It's been a good day, thank God! Since the original Foreword to this book was written in 1939, a wholesale miracle has taken place.... Many of our friends encourage us by saying that this is but a beginning, only the augury of a much larger future ahead. I'm well aware the subject is the fellowship of Alcoholics Anonymous. Yet, it spoke to me as to my own recovery, a metaphor. I've got recovery. I've had a wholesale miracle in my life. But I sit here, convinced there's more recovery available, there's more peace, more serenity, more freedom from fear, more... recovery. I want it. I claim it. It's mine. The peace I have from this passage is an augury of a larger future, a larger recovery, a larger life ahead. I asked God today to teach me to pray. What came to mind are the words of a time-tested hymn, "Jesus Is All the World to Me." It says when he couldn't get his music published, Will Lamartine Thompson (1847-1909) started his own publishing company. That resonates with me as do his words, my words, my augury. After stumbling around for about ten days, I'd put two back-to-back abstinent days together when I went to bed last night. I got up, packed, and prepared for a night away from home. Fortunately I'm taking an OA member with me, not going for OA purposes, but my friend will be there and abstinence on the trip will be easy. But husband is not happy that I'm going, considers it for "cult" purposes. I told him it was not OA, it was another international organization where I hold a leadership position in my area. Still, the anxieties accompanied me away from home this morning. And my hand sought out change in the console to stop at a donut shop. I set it down, thought of the OA member who might call me with her food for the day while I was stuffing in the old comfort food. "Comfort" food that would bring me discomfort, guilt, remorse, and shame. So, I made it to the office, abstinent, I sit here abstinent, and I'll be abstinent tonight when I report to my food buddy. I went to another meeting of the other organization last night. They post a word everybody is supposed to use during the course of the meeting. The world last night was "umbrage." I used it last night by telling them I had realized during the course of the meeting that the word is virtually always used with "take." Nobody gives umbrage, shares umbrage, borrows umbrage, assigns umbrage. It's a lot like resentment. It's all our doing, and peace and tranquility, as well as the lack of umbrage and resentment, is up to us under the wing of our higher power. Thank God! "Thou shalt love the Lord thy God with thy whole heart and with thy whole soul and with thy whole mind." This is the first Commandment. The problem is, how to love God? We are only too conscious of the hardness of our hearts, and in spite of all that religious writers tell us about feeling not being necessary, we do want to feel and so know that we love God. I was 22, maybe 23. It was the time of a phenomenon called The Lay Witness Mission, and we were in the midst of one of them in my church. While I would discuss theology ad nauseum with the proponents of that movement right now -- or at least I would have before OA -- I recall and ponder, believing, what one woman said. I'd said their ritual prayer, and she asked if I was changed. I said I didn't feel anything, and she said I was, because of the prayer -- that I had asked and therefore had changed. Yeah. That's God. Sometimes he sends feelings, but they're not necessary. Step 2 does not say we came to feel but that we came to believe. The second appendix to the Big Book addresses that. I saw someone yesterday. In normal circumstances I would have known I was supposed to know her but because of my difficulty in remembering names would not have known who she was. In that place at an event honoring the friend who introduced us to each other, I knew. And I knew she didn't know me. I have a picture of myself one night she was in my house, March 2, 1999. There was about a hundred more pounds of me then. I reintroduced myself to her, and she was astonished. We can know people right by us and not know it. We can know God right by us and within us without recognizing him. But he's just as much there, just as dear. And we love him without knowing we do. Thank God! Jesus' disciples asked him to teach them to pray. They'd been LIVING with him for a while by then. Why did they need a lesson in prayer? Even if they didn't pray TO him, couldn't they have absorbed it? So that gives me a good excuse for not getting hold of this prayer/meditation stuff, right? Excuse is not the operative word, not the correct word. How about rewriting that sentence to, "So, that provides insight into shared insecurities, shared distress over this form of communication, right?" In prayer, only one of the two of us has to be perfect, and like a truly great individual, the one who is doesn't need to flaunt it, nor does he make me feel inadequate. I do that all by myself, and it hurts him and it hurts me and it accomplishes nothing put putting a block between me and him. We get to a spiritual awakening by the time we really work the steps. It's an implied promise, "Step 12. Having had a spiritual awakening as the result of the result of these Steps...." It's not my obligation to have it, to make it happen. It's my obligation to let it happen and get out of the way. Help me do it, God! Living on the same level as the rest of the world is refreshing; but it's an astounding and remarkable change from my mindset most of these long years I've been interacting with folks. My universe was in large part three-tiered, though I never thought of it and would have argued "back then" for many more tiers. Yet what mattered was my own level, and I never actually contemplated for those not on my level – in other words for all other people living or having lived – whether one was higher than another. It didn't matter. I occupied the middle stratum, standing alone. And lonely. Lots of folks ranked higher than me, in my mind, and I certainly looked down figuratively if not literally on many more. But I was equal with nobody. Now it's a level plain, large and populated, abounding in interesting, compassionate, and diverse folks struggling along with me, rejoicing with me, grieving with me – company. No longer is it a lonely place. I didn't change. I just got a new pair of glasses. It's a tough day. Really tough. Then I got this quote in my email box. It helps. We have not even to risk the journey alone; for the heroes of all time have gone before us; the labyrinth is thoroughly known; we have only to follow the thread of the hero-path. And where we had thought to find an abomination, we shall find a god; where we had thought to slay another, we shall slay ourselves; where we had thought to travel outward, we shall come to the center of our own existence; where we had thought to be alone, we shall be with all the world." I've tried to read Campbell's The Hero's Journey before, but if he writes this well, I think I better find it and read it. A woman I'm sponsoring is sending me her gratitude list daily. It's helpful to put into perspective my day's activities and emotions -- and to remind me of my own gratitude sources. I just came back from a trip I found to be a real joy. Obviously, there were issues with the trip, more with this trip than with some, and my own negligence and trust-placing caused some of the surprises. Still, it was an awesome experience, an opportunity to observe the world's beauty and vastness, My travelling companion acknowledged the beauty, but dwelt on the inconveniences. What a loss! Perspective is important in looking inward as well as outward. Yesterday I got a test copy of a product I put together. Most of it looks great. My mistakes, though, are what I think of first, but they'll be corrected -- that's why we went to the expense of getting a test copy anyway! And the final product will be glorious. I got a check yesterday made payable to an entity that has no bank account. But hey, I got a check, and the bank can expand the allowable names on the account, I bet! I left a small bowl of chili out last night, necessitating it's being added to the dogs' breakfast rather than a later meal. That was stupid. But I put the majority of the unused chili in the refrigerator appropriately. Yeah, the waste was still stupid. But the financial loss is not worth the emotional enmity. I'm okay. I'm REALLY okay. Look how far I've come! A car in front of me this morning slowed down unexpectedly to enter the AM Donuts parking area. Two years, six months and a couple of weeks ago, that would have been my car. I no longer felt any need to go there, thought "My car doesn't make that turn anymore." I amended the thought, though -- there's a fruit vendor in the same lot. But I have no need for the donuts. Thank God! One of the glories of the trip was I reveled in creation, in people, in new experiences -- not in new dishes or in stuffing all the food I encountered into me. I ate no sugar, and I didn't eat more than I needed. Thank God! I remember a conversation with my younger son another June 6, sometime around 2004 or 2005. Of course historically, this is D-Day, the landing of Allied forces at Normandy. I was born a Baby Boomer, have no memory of WWII, and to be honest I remembered D-Day's date then because of its personal significance to me -- not the invasion, but my own D-Day. Anyway, we were discussing the historical one and he, born in 1980, said he bet half his generation didn't know the significance of June 6. I said half of MINE didn't know, and less than a tenth of his did. All the estimates are probably too high. Anyway, personally my June 6 was in 1997. It was the climactic event of what I lovingly call my "hell year" from October, 1996 to November, 1997. On that day I was so tense, so earnestly trying to hold my world together, I reached up rather casually and severed by rotator cuff with sheer tension. Because of that moment, circumstances made me realize I was killing myself and not managing to help anybody else either. And I began to try to figure out how to take care of myself. But for a while I continued to do it medicating with the food, though I also met an angel who massaged me with her hands and used her words to start waking me up to "the things I cannot change" and giving me the courage to change the things I can. It was a long trip. Through a psychologist, then finally another counselor steeped in the wisdom and traditions of these rooms, and together, through ten years, God used all the events to bring me to the morning of December 17 when I told him life as I was managing was "Stupid!" And it was. But under new management it's fantastic. Thank God! A neighboring town had baseball-size hail; we were in the path of the general storm, had no idea how badly we'd be hit. (Short answer: not even much rain.) With excess cars over garage space, we took two cars to find shelter elsewhere. The story is long and involved, but basically I was in one car near my husband in the other, and I was faced with the question of whether to move for somebody else. My instinct was to move. But I fell back into the fear, into trying to imagine my husband's thoughts, and I did what I thought was rude because I expected it would be his choice. It wasn't. He thought I was rude, too. And I was. But my big issue (especially since there was no hail after all) was what it felt like to regress to the character defect of trying to please by abandoning myself, by surrendering my will to the wrong "higher power." This program is a miracle. son: The converse to the statement is also revealing. me: yeah. Like going home and reverting? son: like going somewhere that has changed and that revealing how little change has happened in you. I read for the first time this morning Kahlil Gibran's addressing the issue "On Crime and Punishment." The phrase that grabbed me and sent me to find the rest was "And how shall you punish those whose remorse is already greater than their misdeeds?" It's a powerful piece of writing, one that makes me think from the perspective of the criminal justice system, but even more as a recovering compulsive overeater. It really doesn't matter whether we're thinking about the wrong people did us or the wrong we've done others. It says we're all equaled, all "sinners" and all "saints" or at least we're as high as the highest among us. Fascinating. The perspective I see right now in reading this, the reason this draft has been sitting open on my computer for a while, is in looking at those who make my life uncomfortable. Through program I've come to see their behavior as the same as mine when I was struggling to like myself. The blame placed on me by the other is not my blame to adopt, as I was so quick to do for so many years. It's his or her own, and no matter what I do, I can't take away that blame, can't relieve him of it. Nor can I punish him for dumping it on me, for that only serves to give him another focus, to make his self-reproach something he can hide from himself in his anger at me. I feel sorry for him, for I'm no longer playing the game, and I see his hurt, his misery. His remorse greater than his misdeeds -- and far greater than any punishment I could mete out. It struck me today, trying to figure out what that last phrase of the 7th step prayer is and going back to look at it, that there's a significant change in shift between the 3rd step prayer and the 7th. I've been making a mistake in the 7th step prayer, praying for power. That's a REAL mistake. Now that I've spent the morning, or at least bits and pieces of it, thinking about power and strength, I realize they're far from the synonyms I would have told you they are. In fact, in program at least, they're polar opposites. In recovery, power is a god attribute, God being described as our Higher Power as we understand him. We do use power in the 3rd step prayer, but it's not our attribute, but God's: "Take away my difficulties, that victory over them may bear witness to those I would help of Thy Power, Thy Love, and Thy Way of Life." In fact, what we're asking for in the 3rd step prayer is surrender of our power. "I offer." "Relieve me." "Take away." The only affirmative request is, "May I do Thy will always!" Then to the 7th step prayer, after walking the path through 4, 5, and 6 -- a path that can at times feel like a gauntlet -- through the triumphal arch. "I am now willing." and "Grant me strength... to do Your bidding." It's not "grant me power." Strength is defined as "the power to resist attack; impregnability," "the power to resist strain or stress; durability" and as "a source of power or force." Power, on the other hand, is defined as "strength or force exerted or capable of being exerted; might." Like many similar words in English, one (power) comes through the Roman/French influence, "to be able." Strength came through the old English, celtic influence. I guess I finally arrive at the conclusion that having power is okay, but seeking it is not. And having power, without seeking it, we're in the position Jefferson envisioned and Benjamin Disraeli described: "Power has only one duty -- to secure the social welfare of the People." 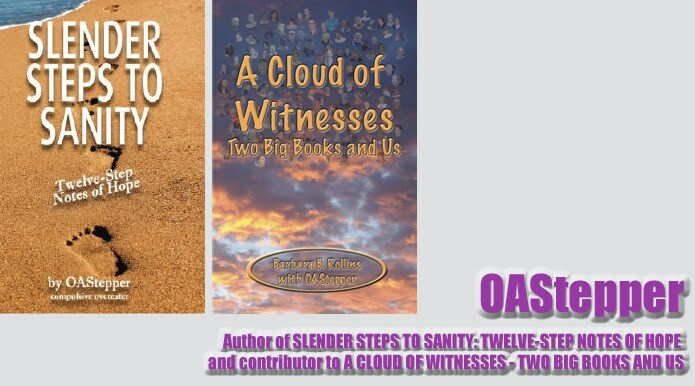 First, I had promised to lead my readers here on the blog know when I mastered the intricacies of uploading Slender Steps to Sanity as a Kindle book. I did. (I hope.) Since I'm writing here about ego, I'll say it was both a boost to the ego in finally figuring it out (with a little help from a computer guru I raised) and a reality-check in the work it took to get my stuff up and out there. And it led to a touch of humiliation and a healthy serving of humility when I found that the mention in the text book of "seremity" left me anything but serene. Sigh. Anyway, the Kindle book is now available. 8:39 PM me: okay. one minute. 8:51 PM Sponsoree: i'm still here for a bit. i'm going to read a few pages until hubby turns the light out. 9:01 PM me: Okay. I got my fire put out too. As I look at this, obviously I wasn't very honest. My one minute the first time took nine, the second time that same minute came up, it meant seven. And she and I were both busy being the "center of the friggin' universe" at the moment. I talked yesterday with my therapist. She pulled out some facts in my life -- honors and achievements -- I hadn't talked to her about, and she tried to make me realize how special they are. No, I hadn't told her about them, for I'd been working with her to get to the core issues, and I didn't see the need to try to impress her. But I do understand how special they are, and when I'm insecure I find ways to work those kinds of facts into my conversation. Last night I was in a crowd of people (about 40) I didn't know. Well, one I've known for twenty years or so, and another I've been married to for several decades, but most of them I was meeting. And I don't remember names well and don't easily blend into an established group of people. When I dropped my most obvious impressive credential, though, the answer was, "We know." Well, yeah. It's kind of obvious, and the kind of thing people would know even just talking about him, as "his wife is...." But something about me needed to say it, needed to establish a foothold of credibility. Standing on my own two feet wasn't enough. It is with you, my OA family. I'm me. I'm on the same pedestal you're on -- well, at least the same podium. Pedestals are too lonely; podiums are raised and can be shared. I like that. I used to live in a tri-tiered universe. I was on a lonely pedestal with nobody near. Above me were those I hero-worshiped. Below me were the rest of the masses. Sometimes the populace above was multitudinous; sometimes that below. But my pedestal stayed lonely. Then I came home. I don't have to be the center of the universe, nor do I have to stand alone no matter what level. We're all equal, we're all God's kids, and we're all worthy, without having to impress anybody. We're loved. Wow. That's absolutely the way I feel. 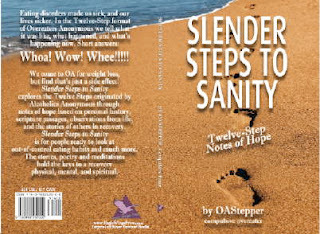 My Slender Steps to Sanity is here, but I strongly feel it's not my book. Maybe "ours" meaning belonging to the whole fellowship, maybe God's. But its not mine. I will be buying a number of copies at my author's discount and sending them to individuals I know in OA and to individuals connected with groups and intergroups I haven't met. I'd appreciate your help in doing this. I'm sending them as a gift. If you want to make some of them your gift as well, there's a link to the right where you can contribute to the printing and postage costs. If you know of OA's who should receive them, you may email me their physical address. Thanks for being there, for giving me the message so I can carry it to others in this way and more. I'm so totally blessed. I love you all. My friends at Silver Boomer Books took cover drafts for my new book (Slender Steps to Sanity -- Twelve-Step Notes of Hope) to a meeting last night, asking for votes on four possibilities. I tallied the votes, and there was a clear winner, but it seemed everybody had a very definite favorite, and they disliked intensely the other options. So God took over and told me the answer. "None of the above." He's right. The new cover is perfect, then to top it off, God addressed another issue I've had with the book forever: How do you market a book in OA? He told me. "You don't." But the whole story is even more interesting. Half my life ago, I entered into a partnership in my chosen profession. Soon, I was bringing in more money than any other partner. Then the partnership fell apart, and I was left as a self-employed professional. My billing fell off -- I gave my services away. I could earn money for my partners, but not for myself, and that was at a time I really needed the income! I ended up finding an employer who would give me a paycheck for my services, and I've been loving that job the last 21 years. I've had books published before, and I know very well books get sold these days only when the author markets them -- at least until the writer get to the point of best sellers, but even those generally find the writer out pitching the book, just in grander forums to more people. My books have been praised by those who've read them. But plenty of people haven't read them. Add to that the fact of writing anonymously, the marketing of this book has been a fear that probably kept me from getting it out earlier. But then, my kind friends at Silver Boomer Books are in business to sell books. Now, don't get me wrong. They're so open to recovery, to our kind of service and our message, they've developed a Recovery imprint for their third book (my new book) as well as for others planned, one very close to publication. But still, business is business, and they need to be paid for their trust in me and my book, though I've always said I won't take any profit from this book but will give it back to OA and compulsive overeaters. So, this morning I woke with my answer. God's answer. I'm going to use the free books I get as part of my contract with Eagle Wings Press (Silver Boomer Books) and give them free to others in the rooms of OA and looking toward the possibility of exploring them. Then, if the recipient wants me to keep giving them away, I'll give another away for every ten dollars given to me. They can say to whom the book for their money will go, or I'll choose various intergroups and groups or individuals. It's a way I can do service and the recipient can pass on the service, doing their own for somebody else. The book has been sent to the printers. We'll have it within a couple of weeks. Now, I've got to find out just what God wants me to do as the next right step. But first, I want to thank you, my readers. The book started out as meditations here on this blog, and your support has been invaluable to me. Thanks! I've recently had two people ask me to sponsor them, coming from encounters with other members of OA with whom they could not work. I was reminded of that, reading this morning from Not God, A History of Alcoholics Anonymous by Ernest Kurtz. Kurtz goes on to quote Wilson as saying "The way our 'worthy' alcoholics have sometimes tried to judge the 'less worthy' is, as we look back on it, rather comical. Imagine, if you can, one alcoholic judging another!" It's like raising children. You can tell them, give them something to rebel against, or you can show them. I've done enough telling people what they ought to do in my life. God, help me live to show them how to let you tell them how. I enjoyed the meditation readings today, but the reading that's sticking with me is the cartoon today, One Big Happy. The mother's answer to the question about why it's called bath tissue is that sounds nicer than toilet tissue. Begging to differ, the child says toilet contains two of her favorite words, toy and let, the illustrative sentence making her name the indirect object and toy the direct object of a directive sentence. Bath, on the other hand, does not sound pleasant, and she stretches out all the sounds to illustrate. Father, entering the setting, says he feels her pain. He, too, hates to get a hair stuck in his mouth. Husband asked me yesterday if I'd called one of our sons to see what's going on with a situation. I said no. He said I didn't seem to care. There's no reason for me to even ask if he's called the son this week or this year. I've been getting some medical help the last three weeks, getting a lifelong bad habit corrected. The presenting problem that drove me to the extreme of finally taking care of it, though, wasn't getting better. On Friday they discovered the two weren't related, and with treatment for the presenting problem, now finally there's considerable pain relief there. We've thought we knew the answers all our lives. Maybe we did, but we didn't know the questions until we started turning this life over to God and seeing his guidance and direction. My abstinence is clean since March 30. Thank God! DENIAL. Don't even know that I'm lying. Geesh. I have told many of you that the betrayal last April/May was one I was able to take in stride, that I wasn't angry, was over it. Denial. Don't even know that I'm lying. Yes, the woman who betrayed me is a sick woman, yes, I've moved past the professional hurt. But still, there were relationship issues way behind that, and the plain fact is, I weigh now basically what I weighed last April/May. I didn't let it go. I held on, tight, keeping the resentment and the hurt on my own body. As though that could hurt her. How ridiculous. How true. But not, it's not denial. Now I know I really am over it. Maybe it was the April around the corner that got me here, because the first part of April was when the other stuff started happening last year. But I've been absolutely abstinent since Monday first thing, March 30, and I'm not denying I'm taking back my life. I just looked back, expecting the last who-knows-what number of posts to reflect a struggle. I didn't find it -- primarily, I assume, because when I'm posting it's from a position of relative strength. The absence of many recent posts, then, reflects the struggle in its silence. And this post says there's strength again. It's not mine. I'm powerless over food and my life is hopelessly unmanageable -- by me. Fortunately, I can resign control and sit back and watch while the master pilot straightens the course. I met a 97-year-old man today who desperately wanted to go home, to "escape" the nursing home. He fully intended to continue to mow his lawn using a walker, but he was willing to hire somebody to do the edging. I made it possible for him to go home, though I limited what he could do there. But I hope at that age I'm not ready to give my life away to useless pastimes, either. He and I both have just the one day. May each of us live life fully and completely this day! That was my hang-up as to religion/spirituality to some extent, but it was one that once I finally got to OA was quickly overcome. I find it true now as to OA itself. I do understand OA, the principles, the literature, the Steps, the lifestyle. But I got careless, became content with the level of recovery I'd reached. Now that I realize I walked away from the real mother lode, or at lease declined to "pick up the egg," I find my self living the truth of the statement. But there is a way. It's the one Bill W. was struggling with in the early '50s. Influenced by the events surrounding him, Bill Wilson began and ended his portrayal of A.A.'s Twelve Steps as "a way of life" by stressing the continued necessity of the total deflation of even a raised bottom" and the persistence in even the "recovering alcoholic" of childishness, immature grandiosity, and infantile defiance. Between these themes and derived from them, Wilson located an ancient motif. The key to the A.A. Way of Life was -- simply -- "humility." Like Micah said, even before Epictetus, what does the law required of you but to act justly, to love mercy, and to walk humbly with God? I passed a milestone of sorts a few days ago. About the time I started concentrating on sitting down with program literature and God each morning, I began to write the year on my For Today book, and since March 26, they now have not only an "08" scribbled at the bottom but an "09" companion. I'm not good at keeping good intentions, so to have done it for a year is momentous. I'm looking forward to that time when I grin at those on the tattered pages, knowing the intervening years didn't need the penned reminder I've been doing this for lots of years. But for now, I'll add the "09" each day. When I got Voices of Recovery I started marking the pages of it, as well, but that' more for my remembering what the date is should I pick it up before For Today. Those marks on the page begin on October 28. I'm settled into my third year in program, but I've struggled with myself lately, trying to wrest back control. Those old habits of many years seem to have such a strong pull. One of these years, those will be a distant memory and the meditation time just as set as they feel now, but much more welcome. It's been an interesting week. Last Saturday we had an exciting offer of help, one that's been tough for me to take, as tough as the evaluation of a hard-fought manuscript by an expert in the field, something you know will improve your work, but it's MY work, and I don't "feel" the need for it to be improved any more than I "feel" the need to resist the pull of the old harmful habits. It means the book that began here on this blog will be delayed a few days or a couple of weeks -- that I won't have it when I go to my regional OA meeting. But the book will be better when it does see the light of day. And my humility will be strengthened. I've done better on food today and the past two days. After I "restarted" on Monday it didn't last, but this one, beginning Thursday morning will. I know. I've come to realize the truth of a statement made on Wednesday at my OA meeting, that we can overeat on abstinent foods. Not that I've stuck to abstinent foods since I've been struggling, but I know it's more the behavior and the mindset than the food being eaten, and to work on that area, I'm going to start the Steps over. But I won't dawdle, for I know a lot of the work I need to do is later in the steps, though of course the first three are the foundation for them all. I also will start today doing a better -- okay, rigorous honesty. I'll start today consciously doing Step Ten, something I've never done on a regular basis. I'm ready to change myself and lose the bounds. I went to an event yesterday I expect will change me, again. The last two of these annual events have been momentous growth events, and I can see yesterday's leading me further in the right direction. These have nothing to do with compulsive eating. Rather, it's a gathering of writers. Still, the well-known writing professionals who have spoken at these meetings are inspiring human beings who speak to me on all levels. The central message yesterday was to claim the prize set out for us, to not let temerity or low self-esteem hold us back. He told of a childhood Easter egg hunt, of finding the grand-prize-winning egg and feeling he was too young to win the bicycle, of failing to pick up the prize, of watching as someone else claimed it. Since then, he's done a masterful job of claiming the prize laid out for him. Even as I sit here typing, I'm thinking, "I couldn't do that." How many prizes have I avoided because I wasn't worthy, because success scared me? I entered a contest once, a prestigious international writing one, and while I didn't win, the editor of a major imprint of a super-big publishing company wrote me a personal letter telling me how to fix my book, directing me to send the rewrite directly to her. I didn't know how. And I didn't ask people around me for advice to help me make the growth spurt she was asking for. When I finally did the rewrite, she no longer was at that publishing house and my efforts to put my book before her failed. I've sent yesterday's speaker the covers of two books out little publishing venture intends to offer in the next few weeks, accepting his gracious offer to critique them. And I'm going to grow enough to correct errors pointed out. He said something else to me privately that may make an even bigger difference. I was the last one through the serving line, having a role in coordinating and managing the event. My food plan is heavy on protein, and I took an ample serving of brisket and sausage, neither of which are preferred foods on the plan, but they were the protein available. Besides that I had a spoon of cole slaw and a small serving of pinto beans. And he commented on how much food I had on my plate. My resentment wants to rear it's head, but instead, I'm taking it as a growth point like all the rest he gave. A trusted friend helping me work my program suggested this week that I imagine myself not at the lowest weight of my adult life, which is true, but which has remained pretty stable for a year now. She suggested instead I think of myself as always thin and having reached this body size, which is 190 pounds or thereabouts. If this weight horrified me as much as the 300 pounds did once upon a time, wouldn't the motivation to really work this program be stronger? Yes. It would. And I know I'm still too heavy. My right knee has been painful the last four or five days. I've still been climbing the steps to my fifth floor office, knowing that may be stupid or may eventually help. Yesterday I wore slacks so I could have a tight garment around that knee -- but the garment was bought about 40 pounds ago, and it's not that tight anymore. One more facet to the growing pile of proof it's time for a new surge in spiritual awareness, in humility and in accepting God's abundance, came in the fact two trusted friends have recommended I see Shirley Valentine. One of those suggestions was over a year ago, in February, 2008, and since that time I've had a note on the dashboard of this computer that says, "Shirley Valentine, 1989 British release." I was loaned a copy last Thursday, and I've now watched it twice. And ordered a couple of copies of it so when I give this one back, I'll have one to keep and one to loan out. Today I am abstinent, I am claiming my Easter egg, and I'm trusting God to remove my fears and show me who he would have me be. Thank God! What does it mean, the victorious will inherit the blessings? My dictionary defines victorious only as an adjective. Of course I know it's used as a noun, not just here, but other places, though it's perhaps somewhat dated. Interesting. That's two dictionaries now. Just a minute, I'll be right back. Okay, having found dictionaries generally agree as to the adjective status, that leaves us with an implied noun modified. We could get creative, but "person" will do. Or simply "victor" rather than "victorious person." So, the victor inherits blessings. Look at the verb! Inherit. Pass by intestacy, pass without a will. (If there's a will, property passes by bequest, it's not inherited.) And who gets the property that passes by intestacy? Family. Spouse, children, grandchildren, parents, siblings--it depends on the particular situation and the operative law. Those are the rules. But what's going on in this passage? God's saying all things are new. Who's the new family? It probably still includes the old family, but add in your OA family and, well, all God's kids. So, the victorious inherit blessings. We talked about the part of speech but didn't really consider the meaning of this victorious victor. Winner. Is that like those phone calls that say I've won something, the ones I cut off because of anticipated strings? God, I hope not! Winning, victory, takes something on my part fist -- entering a contest, running a race, producing a product -- action, commitment, participation. God could certainly make us all winners free-gratis, without the attached strings. But he doesn't because he's not a puppeteer, not a manipulator. He doesn't give us strings OR pull our strings. Actually, victor comes closer to conqueror rather than winner when we look at the history of the word. Certainly winners have conquered -- the other racers, contestants, or competitors. Conquerors, though, need not have a human competitor. We think of conquest over Mt. Everest, or a personal goal or of an addiction. Conquerors may best fears, disease, or a tough music score. So. To inherit from God the father, or from the children of God, we need to be victorious. Alas. We're powerless over food, our lives have become unmanageable. But it's okay. We've got an ace up our sleeve. Back about the time John was transcribing the Revelation, Epictetus over in Greece talked like we used to talk. He said, "You may be always victorious if you will never enter into any contest where the issue does not wholly depend upon yourself." But he was wrong. We can depend on a higher power! So it's okay. We're already victorious. Paul said it in Romans 8:37: In all these things we are more than conquerors through him that loved us! In the United States when an indictment or information (the charging instrument for a misdemeanor) is issued, almost invariably it will say, "against the peace and dignity of the state." That's a holdover from the concept of The King's Peace (or actually at this point in England it's called The Queen's Peace.) It comes from the concept we innately recognize that each of us has a personal space, and if somebody gets too close and they're not special persons who can be in that personal space, we feel violated. Well, each feudal lord had that kind of space, called his "peace." And he controlled what happened within that space, could make rules that made him comfortable. And of course it goes without saying that the more powerful the person, the larger the personal space that person can claim. So the king's started out pretty big and kings amassed more and more area, taking away from the feudal lords. Then came the concept of "legal fiction" which means legal lie. One legal lie I've always found interesting was the source of the word "felony" but that's another (long) story. The legal fiction I set out to explain is the king's peace. His big space expanded because the king built highways, so his peace went with the Interstate Highway system (or the medieval equivalent thereof, the royal roads.) After that, it didn't take a lot more fiction to just fill all the nation with the King's Peace. I got to thinking about the concept of the King's Peace as it might refer to the King of Kings. For God, it's not a fiction. His presence fills the world, the universe, and beyond. My concept is that God's not in the universe, the universe is in God. So the King's Peace is everywhere. God's peace is everywhere. Wherever you are, God is there and Peace is there. You just have to breathe deep, look for the peace, and, voila! it's in you! I woke this morning to a recovery speaker saying he'd memorized the Third Step prayer wrong, that he was using "Thy love, Thy power, and Thy way of life." When "corrected" as the rest of the group said the prayer, he realized his need to put the love first, for the assurance inherent in the love. Before getting out of bed I prayed the Third Step, Fourth Step ("we ask him to remove our fear and direct our attention to what He would have us be"), Seventh Step, and Eleventh Step ("praying only for knowledge of His will for us and the power to carry that out.") I knew then I needed to meditate, and I scanned my brain for a verse to meditate on, and the answer was immediate. "For my yoke is easy and my burden is light." I realized the yoke's easy, but it is a yoke. It's a frame designed to be carried across a person's shoulders with equal loads suspended from each end. We don't see yokes around here, but I certainly have seen them traveling. 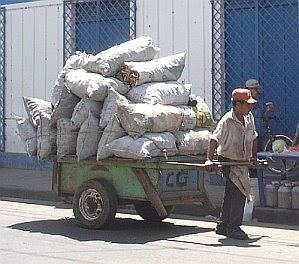 In Nicaragua I took a picture not of a yoke, but of a man-powered transport. A yoke is a yoke. It's an impediment. It's a burden. Abstinence, abstaining from other obsessions, doing the next right thing -- is a burden. Yes, it's an easy burden. Yes, it's light. It's even joyful and freeing, but it's a burden, and when my rebellious self insists "This program's supposed to be easy. I don't have to work at it," I know that's hogwash. I have to surrender to God's will, let him direct me, and to enjoy the company as I bear the burden. And thrill in the destination. Day two, no games, eating on the food plan only. It's a yoke and a burden, but lighter than it was yesterday, heavier than it will be tomorrow. I'm assured of the love as well as the power and the ability for God to direct me to live life his way! Yes, it's been too long. My sponsor nudged me toward that realization, but I already knew it. I sit here today after a productive, abstinent day. I can't say that about yesterday or many of the days in the weeks just past, but today it's absolutely true. I will sit here at this desk another 20 minutes before going a couple of blocks to a meeting. My strong urge was to open that old nemesis, a computer game. I had deleted Spider Sol from this brand new computer I got in January. Unfortunately, I searched for it and found an acceptable version online. And not blocked by the filter on this system. Therefore, it's up to me to block it, just like I've blocked the cherry coffeecake in the outer office all day. I actually don't know if it's still there, and I don't know what it tasted like. And won't. Today I've been busy. I read three devotional books and the Big Book after getting up and while getting the household ready to go with a husband somewhat under the weather. I got to work and spent the morning busy at work-related projects and looking at emails, etc., between obligations. I took part in two interviews for a job and got back to the computer with my immediate obligations met, ripe for opening a computer game. But instead I started working on a project I need to do to meet a requirement on my amends list I composed yesterday. I didn't get much done, can't figure out an excel question, but I did move the right direction. I spent the noon hour with my counselor and ran an errand for an organization, then went to my other office where I ended up talking to the manager of that site then working on a website I should have updated a couple of weeks ago. I went home to check on hubby and get his medicine from the pharmacy, feed him, and see to issues there, and I'm back at my main office. So, it's been a busy and productive day. One thing I did for my recovery, though, this morning was in response to an email poetry prompt, but it describes my intentions in working my program today and for days to come, with God's help. May your day be blessed. Thanks for blessing mine by being there to support me.